I had an email the other day from a client who had wrecked the monad on the NP car he was decaling that he'd bought from me. He'd been using Walthers Solvaset as a decal setting solution. I have to admit I was a little surprised that he was using such a powerful setting solution. Solvaset was created way back when Champ and Walthers were the big guys in the decal world. Thin film decals were but a pipe dream then. The decal film used then was quite heavy and needed a lot of encouragement to conform to undulating surfaces and form over rivets, etc. I still keep a bottle of Solvaset around just in case. And I've had occasion to use it. Sometimes decals won't soften. But 99% of the time Micro Sol is all that's required. I usually find that it's better to work up to the heavy hitting products rather than reach for them first. 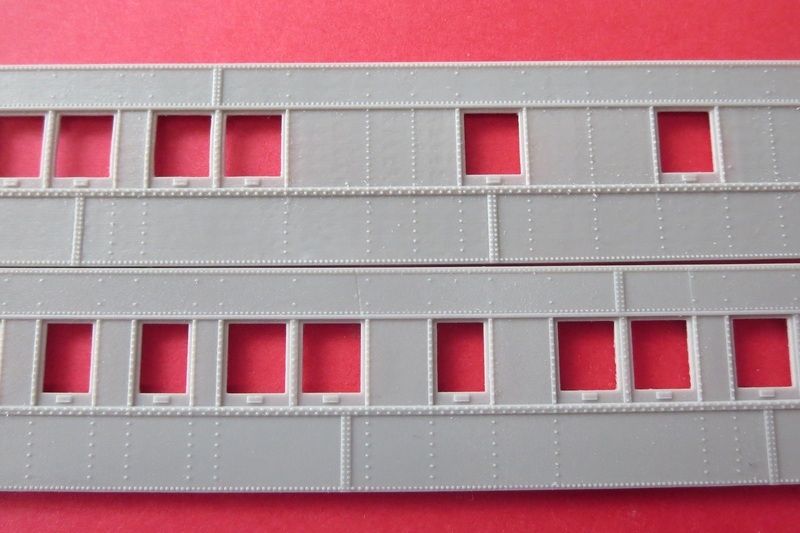 Given that the resinfreightcars Yahoo Group is building a couple of my resin kits for the March group build, I thought I'd offer up a closer look at building my etched ladders. First step is to run a #80 drill through the etched holes to insure adequate clearance for the grabs that will follow. Sometimes the etching process leaves the holes a tad undersized. With that done clip the stiles free of the fret. Xuron makes an excellent set of shears for this task. Next fold the stiles into long angles. I've used, until today, a Mission Models etching bending tool. But again the separate bit that is used for levering the etched part up has broken. So I'm done with that tool. And that is also why there's no photos of this part of the process. I have ordered a replacement. The Small Shop is a purveyor of all kinds of useful tools for photo-etch. I've ordered from them their 4" Mk IV RTH Hold & Fold tool. This should be more than enough for my needs. And I suspect that it will hold up far better than the Mission Models tool, as it is made from aluminum, not plastic. Once the new tool is here, I'll be posting about it. Now for the fiddly bit. Rest a stile on each side of the spacer. Note that there are left and right stiles. Grab a rung with your tweezers and wiggle it into the holes. A little dab of glue and move on. Slide the assembly along the spacer and add another rung and secure. Use your eye to keep everything square. The glue won't fully cure immediately, so you have some fiddling time. With practice you can do this fairly quickly. I can do a full set of ladders for a car in about 20 minutes on a good day. Now about adhesive. Standard CA does not bond well on metal to metal joints. I was told about this stuff by my friend Peter Aue, who is also responsible for a lot of the etching artwork I use. This Loctite product is specifically meant for metal to metal joins. It is pricy, but it is really good stuff. Store it in the fridge and you should be good for quite some time. With the ladders assembled, create some standoffs from 3" lengths of 2"x3" styrene and glue to the inside of the angles. The exact location will vary by car. You may also want to add standoffs to the outside stile of the end ladders as well, again depending on the car. Secure your ladders to the car, and stand back and admire. The result is well worth the effort. We are working on another ladder spacing. 15" rung centres will available soon. Heck, it's only mid-Febuary and I've had enough. This has to be one of the harshest winters since I moved to St Thomas 18 years ago, if not, then since I moved to Ontario in 1979. Prolonged stretches of bitter cold and a hefty amount of snow. And the really bad part, it's kicking the crap out of the layout. The benchwork is drier than it's ever been and the rails are expanding like never before, all due to the inordinate amount of furnace time. I can also tell how deep the frost is in the ground now, by how cold the floor is in the basement. The other day I went to move some trains in preparation for the next "Sea Trial", which will be at the end of March. I had derailments in a couple of locations that previously had no problems. That top stock rail had been glued down with Pliobond when the turnout was built. The rail had expanded so much that it broke the glue joint. It has since been repaired and expansion gaps have been created. I've also had to go around and regap about half of the turnouts on the layout to eliminate the shorts that have popped up since the last time I ran trains a week ago. How much you want to bet that come the summer, I'll be faced with massive gaps in the rails? It's small consolation, but I've reading a few complaints from others about this problem on Yahoo Proto-Layouts. I blame Putin and the winter Olympics in Sochi. Step by step, I'm getting closer to being ready for a proper TT&TO operations session here. I just picked these up from the printer. Can't run a pre-radio railroad without them! Along with the actual timetable, these are the tools the despatcher uses to control train movements in the territory he as authority over. And it was a small adventure getting these things. First a big thanks to Trevor Marshall who actually did the graphic work for the forms. I first went to my local business printing service here in town to try and get the custom work done. Because I was asking for "carbonless copy paper" their default approach was to try and sell me modified invoice forms. They couldn't get it through their heads that I needed an entire pad of one colour of paper. So I went into London and spoke to a commercial printer who actually has a number of printing machines in his shop. Piece of cake for him and half the price of the others. And, bonus round, I now understand how carbonless copy paper works. 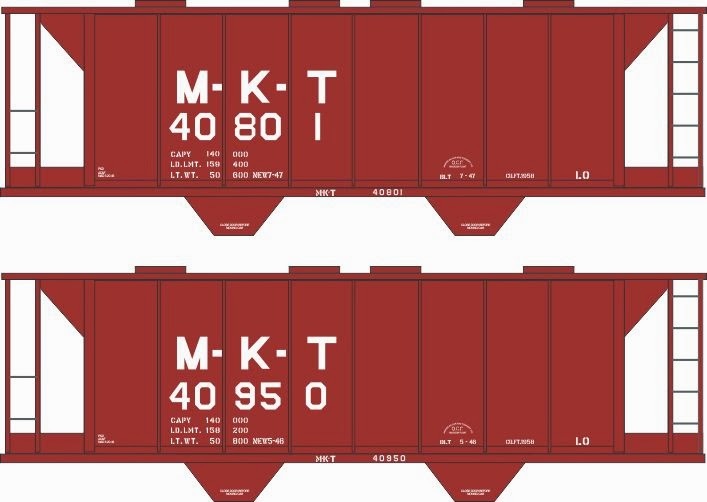 Decals for the AC&F Type 3 covered hopper roof. I've just found out that Gerry Glow is offering 7 different decal sets to compliment our mini-kit. My thanks to Gerry for making this happen and continuing to support our efforts. I thought that as a followup to the conversations on the STMFC Yahoo list about modeling this car, I would post a couple of in progress views of the etched platform that has been created. There are clearly still a view details to sort out, as well as ladders and such. We are also looking at providing a bending mandrel to assist in the forming of the platform handrails. While there's no tentative delivery date on this as yet, anyone interested in this kit should drop me a line at pierre.oliver@start.ca. This way I can predict numbers of kits to create. Sometimes, other people can state your frame of mind far better than you can yourself. Now the "gulp" part. The set of four MJM half sides from moddler.com cost $250, the SLA part cost me $150, less than half what an outside customer would have been charged. Shapeways quoted $84 to do it in FUD, but they would have built the parts standing on edge rather than face up. That is a fundamental problem with Shapeways and is non negotiable. They load as many parts as possible on a build platform, placing each to minimize its footprint. If the detail face is built as a side wall, the detail on it will be degraded. I use Shapeways a lot and can work around that for many of my projects, but not for car sides. The real problem is, the companies that can print objects with the precision and level of detail we want are focusing on commercial customers with deeper pockets. Plus they are using $six figure machines. Competition and demand should bring prices down, but at 77 I don't expect to see a 3D printer capable of cranking out ready to use parts like those sides sitting in my workshop during my lifetime. Tom has eloquently stated what I have believed about 3D printing and it's potential and limitations far better than I ever could. And I will happily admit that we are developing some freight car parts using rapid prototyping. Without the current technology it is doubtful that we could have satisfactorily produced the parts we are trying to create. But we are only using the technology to help us develop the patterns. Production runs will be traditionally cast and the final "print" for the pattern will indeed cost us 3-4 times as much as the test prints from Shapeways. 3D printing is a tool, not an end unto itself. I have done nothing model train related for the last 2 weeks, following my return from Springfield, with the notable exception of getting pads of Form 19 and Form 31 printed in preparation for an operations session here next month. In large part due to work at the Budweiser Gardens in London. 5 days with Disney on Ice, a day each with Elton John, Bare Naked Ladies and Jason Aldean. It all adds up and takes it's toll. Not as young as I used to be. It takes a little longer to bounce back from the 18 hour work days than it used to. But the break from the modeling bench has been good, yesterday I was back down there and it feels a little fresh. Sunday I was at the annual meet at Copetown, Ont, and hooked up with some old friends. And came away with a couple of assignments. I can't really say much about them at this time, more as the projects advance. The other good news is that I'm now restocked on the PFE replacement stirrups and when I get back from Port Huron later today I'll be able to address much of the back orders I have on kits. We've fixed the issues we had with casting, I hope, and I'd like to thank those who have been waiting for their patience. As my good friend Bill Schaumberg says, " Onward!"